In literature and the movies, there is a romantic haze surrounding the silver-tongued con man but the reality is grittier: the bilker filches money from the innocent or unwary. When such a flim-flam man runs for president, the whole country should be alarmed. Meet Mike Huckster. When in the course of human events it becomes necessary for one person to remove a sum which has been connected with another and assume the ownership of said funding, the laws of chicanery and of nature’s fools entitle the flim-flammer to hide behind every little twist and turn of mankind’s legalities. We hold these truths to be self-evident, that all men are created equally susceptible to swindling, that they are endowed by their creator with certain unalienable rights to squirm and bemoan their fate as they move forward with less money to enjoy life, liberty, and the pursuit of as much happiness as they can afford until their next fleecing. Thus begins the creed and credo of one Michael Dale “Mike” Huckabee, former 44th Governor of a state of the Old Confederacy and current bunco artist extraordinaire. 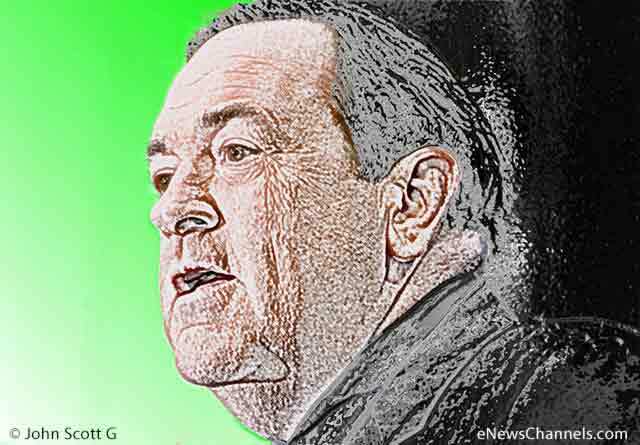 Huckabee is a fairly typical rightwing scumwad who appeals to the great mass of the unwashed, the untaught, and the unthinking. With calls for more guns and less science, more religiosity and less reality, Huckabee is a hero to those with logic disability. In another video hyped by the Huck, diabetes is said to be removed by cinnamon and chromium picolinate, something that is denied by the American and Canadian Diabetes Associations. In his newsletters, the Huckster has sold advertising space to firms pedaling bogus products. One example is the “Matthew 4 Protocol,” a bit of chicanery touted as a Biblical cure for cancer. The fake cure is available free, if by “free” you agree to take out a $72 subscription to a health newsletter. Another example: subscribers to the Huck’s enewsletter were greeted by the subject line, “Food Shortage Could Devastate Country.” The pitch that followed urged readers to purchase Food4Patriots survival food kits. You know, for the coming collapse which is fictional unless Republicans take over the country and bring on an economic apocalypse. Quite apart from how the description itself shows that Columbus did not discover a continent that was already discovered, there is no mention of his tricking and slaughtering the indigenous people of the land. Come to think of it, there’s no mention of our having committed genocide in our push for Manifest Destiny. The title of this little opus apparently came directly from the Department of Redundancy Dept. Wait, “even to this day” — WTH is that all about? That suggests there is a douchebag Conservative movement to eradicate the Supreme Court. Oh wait, we’re talking about douchebag Conservatives so of course there is such a movement. There is no mention in this epic film of the racist and anti-American decisions by the five human turds currently on the bench. They won’t learn here about how Republicans try to screw returning vets by not funding veterans’ health services, veterans’ jobs programs, or veterans’ educational opportunities. Reportedly there is scant mention of Franklin Roosevelt in these tortured versions of World War II. The video forgets to mention how Reagan’s policies almost bankrupt America while beginning the Republican attack on the middle class. Nor is there any mention of Reagan trading arms illegally. And there is no reference to the 138 Reagan administration officials who were investigated, indicted, or convicted for official misconduct and/or criminal violations. This is the only area in which Ronald Reagan is outstanding: his perfidy is the worst ever (the total number for Nixon — a man so criminal he had to resign and be pardoned by his VP — was eight). And for the support of this Declaration, with a firm reliance on the protection of Convoluted Laws and Shyster Attorneys, we mutually pledge to others our Lies, our Fabrications, and our sacred Pursuit of Lucre. Note to the ex-governor: See those angry hornswoggled villagers armed with torches and pitchforks? You’ve fooled them for now but one day, Mike, they will be coming for you.